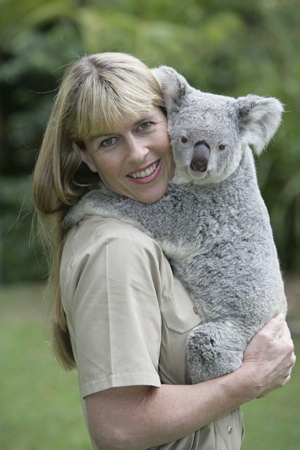 Terri Irwin smiles while holding a Koala. Please go on JW.org I thank your Children will injoy it. Hello Teri, Beandi & Robert am I right;-)))). Well I saw Beandi Danceing with the Stars my Parents watch you they loved how wonderful you turn out they though you danced Wonderfuly. Well sorry again about Steve My Mither & I miss him. Its still hard to believe that your husband is gone... My son loves watching reruns of you guys... Thank you for all you have done and continue to do...your family has amazing passion for wildlife and it's conservation...we need more people like the Irwin family!! STEVE U R ME AND MY SISTERS HERO I COULD NOT BLEVE U ARE GONE IF LOVE ALONE COULD HAVE SAVED U U NEVER WOULD HAVE DIED I WILL NEVER 4 GET U U R MY HERO 4 EVER REST IN PEACE THE REAL TRUE BLUE!!!!!!!!!!!! My 4 year-old is absolutely nuts about two things - Steve and koalas. She just loves this picture since she's a fan of Terri, too! She wants me to print it on a t-shirt! Terri, my sister is kooky for koalas. I'm sure she's sooooooooooooooooooooooo jealous. Bindi is so cute and I love her. Terri I'm jealous! I want to hold that cute fuzzy koala too! Such a wonderful photo! Kathy Timmy Winkler, Sterling Heights, Michigan, U.S.A.